The chief financial officer of the Chinese telecoms giant Huawei faces fraud charges in the United States, a Canadian court hearing has revealed. Meng Wanzhou, daughter of Huawei's founder, is accused of breaking American sanctions on Iran. She was arrested in Vancouver on Saturday and faces extradition to the US. China has demanded Ms Meng's release, insisting she has not violated any laws. The court is deciding whether or not to allow bail. Friday's five-hour hearing has now ended and the case was adjourned until Monday. Ms Meng's detention became public knowledge on Wednesday, but details at the time were unclear as she had requested a publication ban. That blackout has now been overturned by the court. 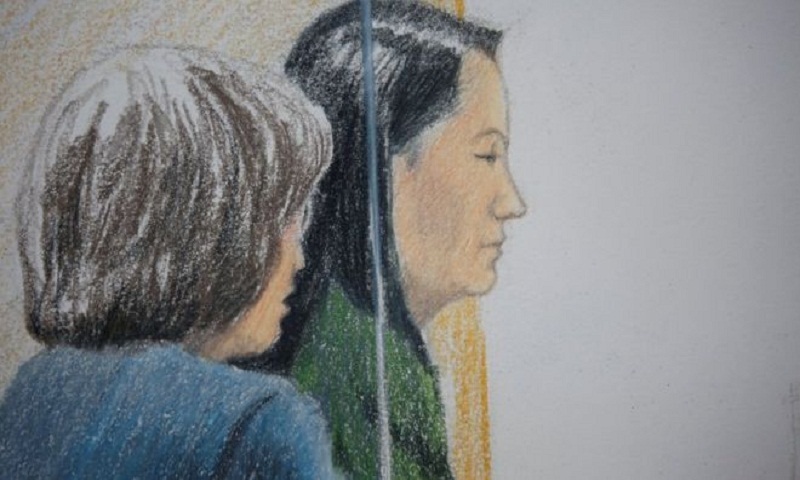 On Friday, the Supreme Court of British Columbia was told that Ms Meng had used a Huawei subsidiary called Skycom to evade sanctions on Iran between 2009 and 2014. The court was told that she had publicly misrepresented Skycom as being a separate company. Ms Meng faces up to 30 years in prison in the US if found guilty of the charges, the court heard. Court reporters said she was not handcuffed for the hearing and was wearing a green sweatsuit. A Canadian government lawyer said Ms Meng was accused of "conspiracy to defraud multiple financial institutions". He said she had denied to US bankers any direct connections between Huawei and SkyCom, when in fact "SkyCom is Huawei". The lawyer said Ms Meng could be a flight risk and thus should be denied bail. Why was the arrest significant? The arrest has put further strain on US-China relations. The two countries have been locked in trade disputes, although a 90-day truce had been agreed on Saturday - before news of the arrest came to light on Wednesday. Ms Meng's arrest was not revealed by Canadian authorities until Wednesday, the day of her first court appearance. Details of the charges were also not revealed at the time after she was granted a publication ban by a Canadian judge. Canadian Foreign Minister Chrystia Freeland said on Friday that China had been assured that due process was being followed and Ms Meng would have consular access while her case was before the courts. "Due process has been, and will be, followed in Canada." Ms Freeland reiterated Prime Minister Justin Trudeau's claim that Ms Meng's arrest had "no political involvement". Does Huawei concern the West? Japan is expected to ban government use of products made by Huawei and ZTE over cybersecurity concerns, local media reported on Friday. It would follow moves by New Zealand and Australia to block Huawei. US National Security Adviser John Bolton said his country has had "enormous concerns for years" about the practice of Chinese firms "to use stolen American intellectual property, to engage in forced technology transfers, and to be used as arms of the Chinese government's objectives in terms of information technology in particular". "Not respecting this particular arrest, but Huawei is one company we've been concerned about," he said. A Chinese foreign ministry spokesperson told reporters: "The detention without giving any reason violates a person's human rights."